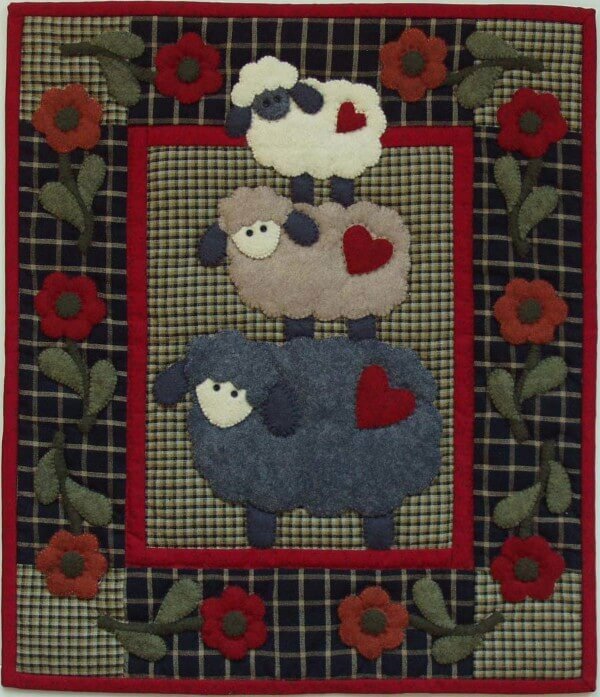 Three sheep, each wearing a heart on its rump, stack up to make this pile of wool. The fluffy sheep and bright flower appliqu�s are easy-to-use wool felt, applied to homespun cotton checks. Finished size is 13in x 15in. Colors are black, red, beige, copper, green, gray, tan, and cream. Kit includes all wool felt for appliqu�, all fabrics (100% cotton) for background, back, and binding, batting, buttons for eyes, patterns and complete instructions.